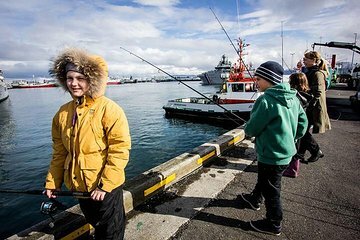 Delight in the tranquility of fishing by renting a fishing rod in Reykjavik’s serene and scenic harbor. Absorb the steady pace of Icelandic life as you fish in the old harbor and enjoy stunning views of the Harpa Concert Hall. Receive state-of-the-art equipment, including bait and a spinning wheel, and await, with anticipation, the gentle tug of a hungry fish nibbling on your bait. No previous fishing experience is required to enjoy this relaxing experience.